Dirofilariasis ( heartworm ) in cats is caused by Dirofilaria immitis. Whilst many people are familiar with heartworm in dogs, many owners are less familiar with heartworm disease in cats. Heartworm disease in cats, although caused by the same organism, is expressed differently to heartworm disease in dogs. Whilst cats can be infected with infective heartworm microfilaria, they are thought to be more resistant to infection with adult ( heartworms than dogs and generally have lower worm burdens than dogs when infected. That said however, relative to the size of a cat, an infection with only a few worms is considered a heavy infection in regards to worm biomass. Heartworm infection is spread via mosquitoes. It is important to note that it is essential for part of the heartworm lifecycle to occur within a mosquito so without mosquitoes, transmission of disease producing infections will not occur. The transmission of heartworm is at its peak during the main mosquito season due to the number of mosquitoes available to feed on animals. Peak mosquito season varies between areas due to its reliance on environmental factors. Warmth and moisture, especially from stagnant water, increase the mosquito habitat. Hence mosquitoes are more common during warmer months and in moister environments. Some areas may have very long mosquito seasons. However it is important to note that mosquitoes can be around year long. Some cats infected with heartworm will never show any clinical signs. There are generally two phases in the expression of feline heartworm disease in animals which show clinical symptoms. The first, acute phase is associated with the arrival of immature adult worms in the pulmonary blood vessels. The expression of heartworm disease in cats can be quite different to that in dogs. Infected cats may show no symptoms or intermittent symptoms such as coughing, difficulty breathing, vomiting, lethargy, anorexia or weight loss. Symptoms in infected cats may resemble those of feline asthma or allergic bronchitis. The clinical signs seen during the acute phase of the disease usually subside, however long term histopathological respiratory lesions are left even in cats which clear the infection. Many infected cats will then show few, if any, symptoms until phase two of disease expression when the adult worms die. The death of adult heartworms causes acute pulmonary inflammation and thromboembolism which can result in sudden death of the infected cat. Another possible outcome in heartworm infected cats is aberrant migration of the worms into body cavities, the central nervous system and systemic arteries. This is fairly uncommon. Heartworm infection and disease in cats can therefore be fatal. Prevention, diagnosis and treatment therefore become areas of interest for the dedicated cat owner. Difficulties have abounded in this area in the past due to the difficulty in establishing reliable tests to detect heartworm infection in cats and for the tests to give meaningful information about the infection. Due to the differences between feline and canine heartworm infections different tests needed to be developed. Feline heartworm blood test kits are now available for use by veterinary practitioners. Veterinarians will however often also wish to combine other means of diagnosis and prognostic tests such as echocardiography and radiography. Since sudden death can be a result of feline heartworm infection and is due to the body's responses to death of the adult heartworms, institution of treatment aimed at killing these adults may be counterproductive as the treatment may itself lead to sudden death via the same mechanisms. Surgical removal of the adult heartworms is one alternate option. Supportive treatment of any clinical symptoms may also be required in critically ill animals. When considering the need to treat feline heartworm disease, the lack of clinical symptoms between the first and second stages of disease progression may cause some owners to not consider treatment due to the inherent risk noted above. Thus, prevention is an important component of managing feline heartworm disease in our domestic cat population. Feline heartworm preventatives are readily available. Before starting your cat on these products individual veterinary advice should be sought. Some products do not require a heartworm test to be performed prior to starting preventative medications, whereas others may. Your veterinarian can advise each owner according to their choice of product. 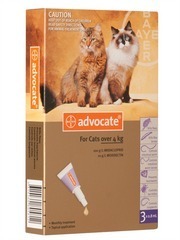 Advocate for Cats a monthly spot-on heartworm preventative which also assists in prevention of fleas, some gastrointestinal worms and control of ear mites. 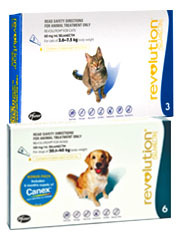 Revolution for Cats a monthly spot-on application to prevent heartworm infection, and also assists in prevention of fleas, ear mites, sarcoptic mites, and some gastrointestinal worms in cats. The ease of application of such products and the wide spectrum of activity against several internal and external feline parasites, make these heartworm preventatives a recommended form of protection for your cat. Preventing feline heartworm infection is a recommended course of action for maintaining optimal health for your cat. Owners should never use canine heartworm preventatives for their cat. An adjunctive method for assisting in the prevention of heartworm infection in cats involves ensuring that the environment in which they reside is not one which provides a mosquito friendly habitat. Removing pools of stagnant water from the area and having insect screens fitted to doors and windows may reduce the number of mosquitoes in contact with your cat. Although heartworm is not spread directly between animals, all dogs and cats in the household should be on heartworm preventative medication for their individual wellbeing. Mosquitoes can fly quite some distance so individual animal preventative medication should be the cornerstone of protecting your beloved cat from feline heartworm infection and disease.